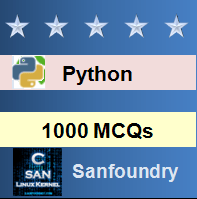 This set of Python Multiple Choice Questions & Answers (MCQs) focuses on “Functional Programming Tools”. Explanation: The code shown above returns a new list containing whole numbers up to 10 (excluding 10). Hence the output of the code is: [0, 1, 2, 3, 4, 5, 6, 7, 8, 9]. Explanation: The code shown above will return true if the given argument is an odd number, and false if the given argument is an even number. Since the arguments are 20 and 21 respectively, the output of this code is: False True. 3. What is the output of the code shown below? Explanation: The code shown above returns the product of all the elements of the list. Hence the output is 1*2*3*4 = 24. Explanation: The code shown above returns only those elements from the list, which are less than 2. The functional programming tool used to achieve this operation is filter. Hence the output of the code is:[1, -2, -3]. Explanation: The code shown above returns the address of m. Had we used the statement: print(list(m)), the output would have been: [-4, 16]. Explanation: This code shown returns a list which contains True if the corresponding element of the list is less than -1, and false if the corresponding element is greater than -1. Hence the output of the code shown above: [False, True, True, False, False]. 7. What is the output of the code shown? Explanation: The code shown above prints a list containing each element of the list as the power of two. That is, the output is: [2, 4, 8, 16, 32]. 8. What is the output of the code shown? Explanation: The code shown above can be used to find the maximum of the elements from the given list. In the above code, this operation is achieved by using the programming tool reduce. Hence the output of the code shown above is 5. Explanation: The code shown above prints true if the value entered as an argument is odd, else false is printed. Hence the output: True True. The error is due to the list index being out of range. 10. What is the output of the code shown? Explanation: The code shown above will result in an error. This is because e have not imported functools. Further, ‘reduce’, as such is not defined. We should use functools.reduce to remove the error. 11. Which of the following numbers will not be a part of the output list of the code shown below? Explanation: The code shown above returns a new list containing only those elements from list l, which are less than 0. Since there are no such elements in the list l, the output of this code is: .The single line equivalent of this code is filter(lambda x:x<0, l). 13. What is the output of the line of code shown below? 14. What is the output of the line of code shown below? Explanation: The output list will contain each number up to 10 raised to 2, except odd numbers, that is, 1, 3, 5, 9. Hence the output of the code is: [0, 4, 16, 36, 64]. 15. The output of the two codes shown below is the same. State whether true or false. Explanation: Both of the codes shown above print each whole number up to 10, raised to the power 2. Hence the output of both of these codes is: [0, 1, 4, 9, 16, 25, 36, 49, 64, 81].Therefore, the statement is true.